For folks who are new to my blog (and to refresh the memories of those who maybe have forgotten), one of my goals for 2016 is to keep a record of every penny I spend this year. (To find out how this project came about, go here: http://www.rubbertrampartist.com/2015/12/31/spending/.) Each month I will give a report on what I bought and how much I spent in the previous month. As follows is my spending report for January 2016. I successfully browsed in a Goodwill without buying anything. 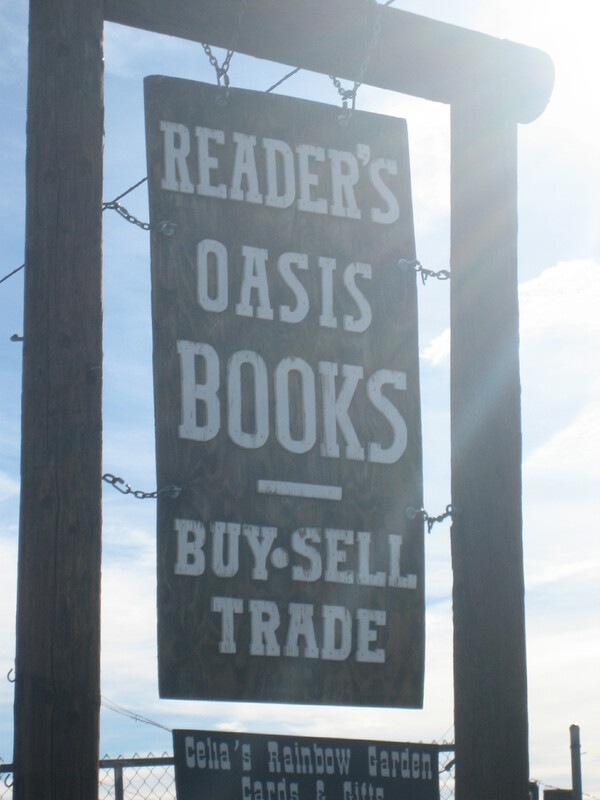 I successfully browsed in a thrift store and spent no money. 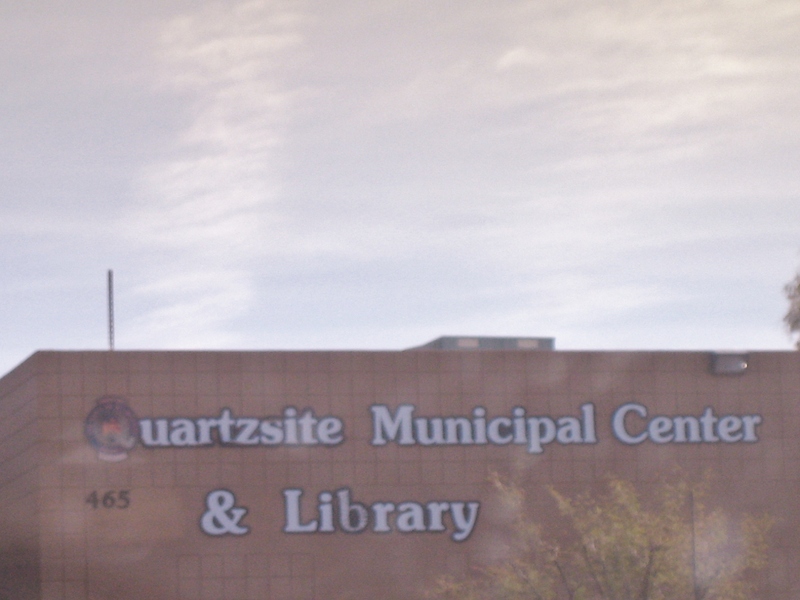 1-15-16 Today I spent no money, even though I went into Quartzsite. I browsed at two thrift stores today and spent nothing. 1-23-16 Today I spent nothing, even though I was in town and there was a farmers market going on. 1-28-16 Today my friend and I went to the Organ Pipe Cactus National Monument. Since she has a senior pass, we did not have to pay the $12 entrance fee for the car. When we left, my friend treated me to lunch. What a nice friend. What a nice day. Nothing spent. Since my phone is on a 30 day billing cycle, I again this month spent $27.78 for phone service. I won’t have to pay this expense again until March. 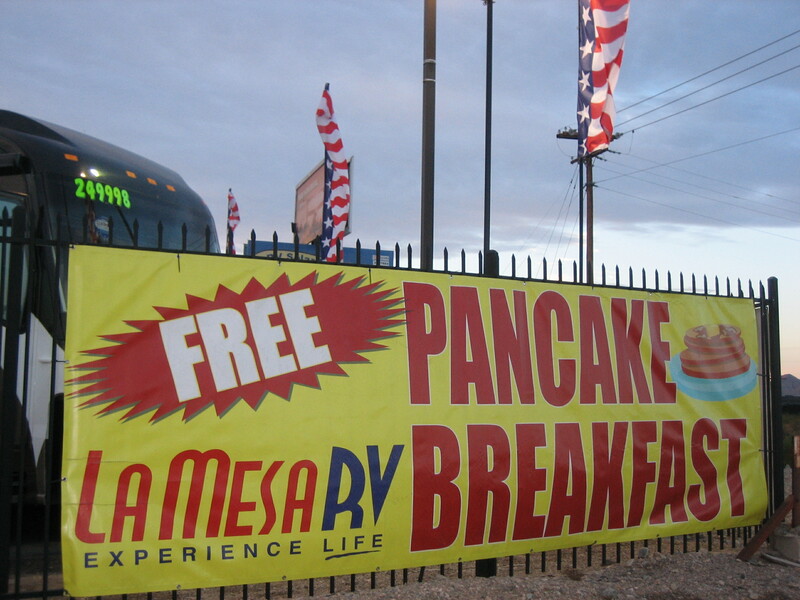 One of my favorite things about Quartzsite in the winter is eating free pancakes at La Mesa RV. La Mesa RV (at the corner of Main and Central [Highway 95] in Quartzsite) is in the business of selling motorhomes and 5th wheels. 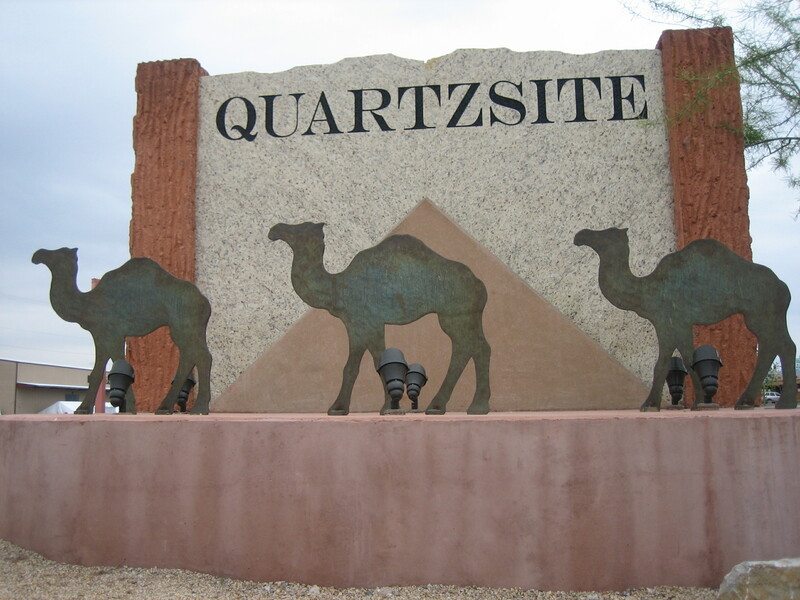 A marketing ploy the company uses to get people on their Quartzsite lot is a free pancake breakfast six mornings a week (Monday through Saturday) from 8am to 10am. 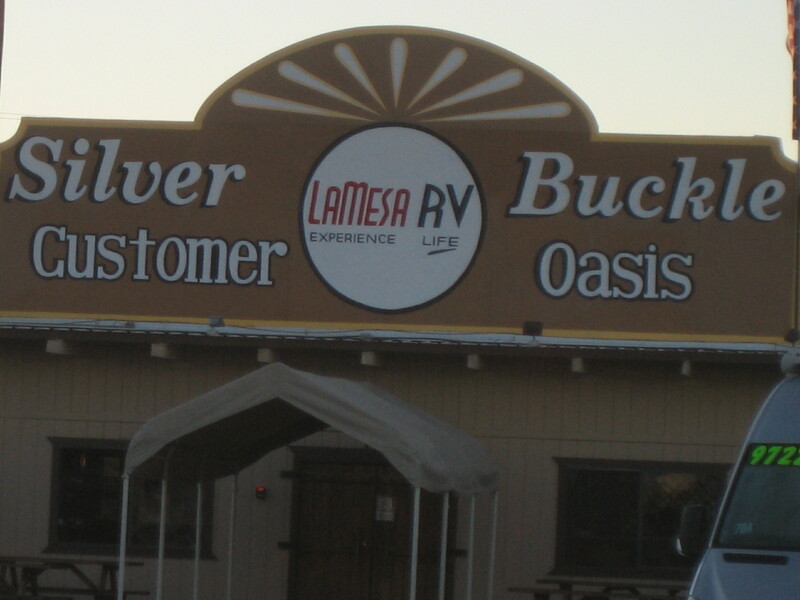 Breakfast is held in the Silver Buckle Customer Oasis, a large room filled with tables. The building was once a bar (I was told by an old-timer), which explains why there are multiple pairs of (definitely used) cowboy boots hanging from the ceiling as decoration. Folks line up at the counter along the back wall to pick up their breakfast. On most days, folks receive two large flapjacks on their plate. Sometimes real creamery butter is served on the side, still wrapped in gold foil. Other days a blob of buttery spread (ingredients unknown) is plopped right on top of the pancakes. Plastic cutlery, napkins, and syrup (regular and sugar free) are on the condiment island at the end of the serving line. Sometimes on Friday, biscuits and gravy are on the menu instead of pancakes. By biscuits, I mean each person receives one biscuit cut in half and covered in white gravy in which tidbits of sausage float. I think this deviation from pancakes is supposed to be a treat, but one biscuit with some flour and water gravy and a few bits of sausage does not fill me up nearly as much as two almost-plate-sized flapjacks. Coffee is available. It’s a weak coffee, so weak in fact I can have one cup of it and not feel jittery. Cream and sugar are available in small paper packets, and I always manage to leave white dust on my table. Orange and apple juice are sometimes available, and there’s drinking water in a big orange cooler. The first time one arrives for breakfast, one must go up to the counter made from the front end of a giant motorhome, and fill out a card. The card has blanks for one’s name, mailing address, phone number, and email address. (I’ve never provided my phone number or email address and was not challenged about my omissions.) At the bottom of the card, one is asked about the rig one currently drives. I was honest and wrote in ’92 Chevy G20. After the blanks are filled in, a woman working the counter writes one’s name on a name tag and hands it over. The name tag lasts all season, and one is required to wear it whenever one wants to eat breakfast. That’s the extent of the hoops one must jump through to get to the pancakes. No salesperson ever approached me to talk about any possible RV purchase, which is good, since the lowest price I’ve seen on any RV there was $17,000. 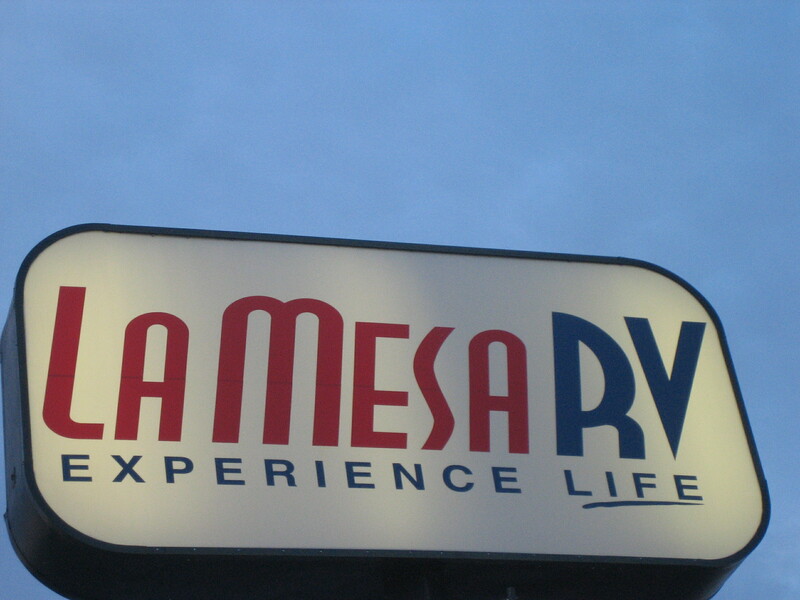 Most RVs at La Mesa are upwards of $25,000, and some cost as much as $250,000! If I had to prove my ability to purchase the merchandise, I’d never be allowed near the pancakes. The only sort of marketing involved with breakfast is being exposed to a video loop of La Mesa propaganda broadcast on the televisions scattered throughout the room. The videos include testimonials from satisfied Las Mesa customers, RVing tips (like leaving solid air fresheners throughout a motorhome when not in use so the RV smells fresh the next time it’s entered), and an educational piece detailing the hand signals one should use when helping an RV driver back up. I can honestly say that not once have any of these videos made me consider buying an RV from La Mesa. Lots of people show up for the free La Mesa breakfast, and most of them are not from the Rubber Tramp Rendezvous. 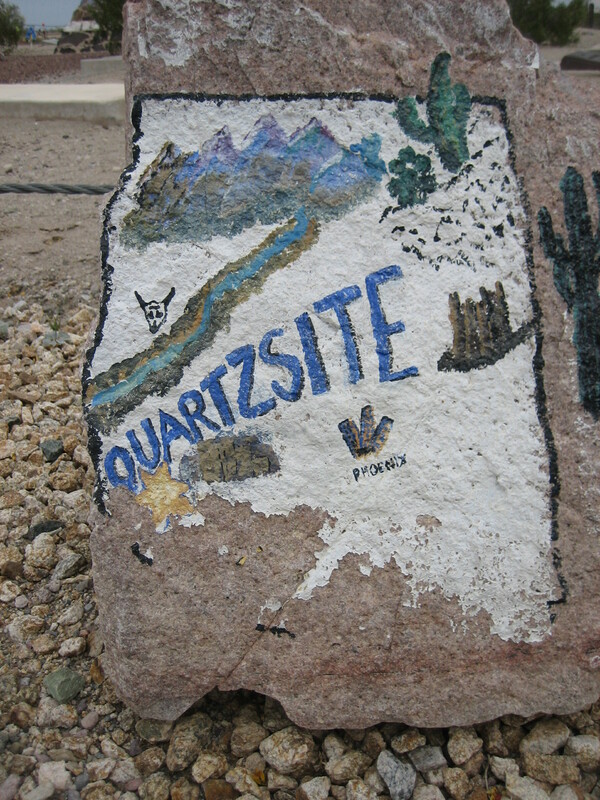 At 44, I was usually one of the youngest people in the room (although as the winter population of Quartzsite expanded, I saw more people who seemed to be the kids and grandkids of the older demographic). One day I caught a quite elderly man looking at me as if I were a teenager! 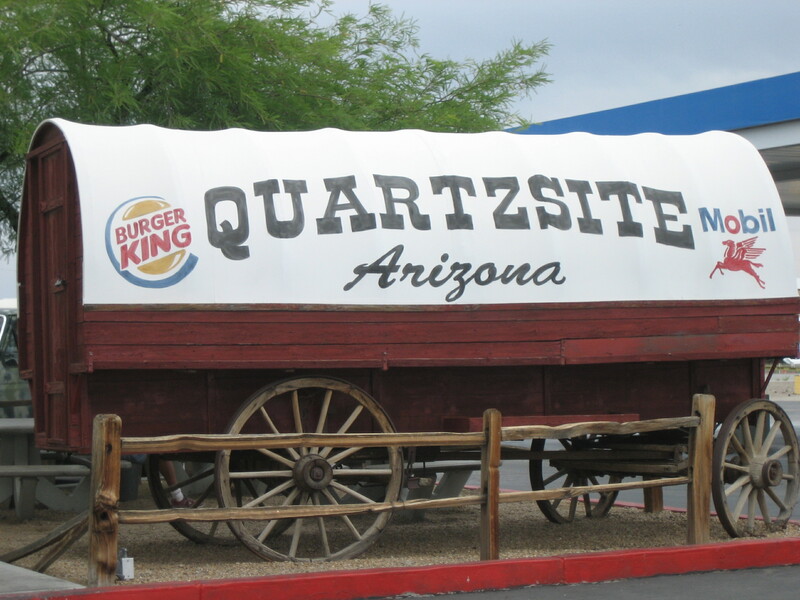 When I’m in Quartzsite, I don’t go into town for the free breakfast every day. I figure I’m not saving any money if I use gas to drive the seven or so miles round trip for free pancakes. But when I’m going into town anyway, I arrive early so I can be one of the first people in line for breakfast at La Mesa. 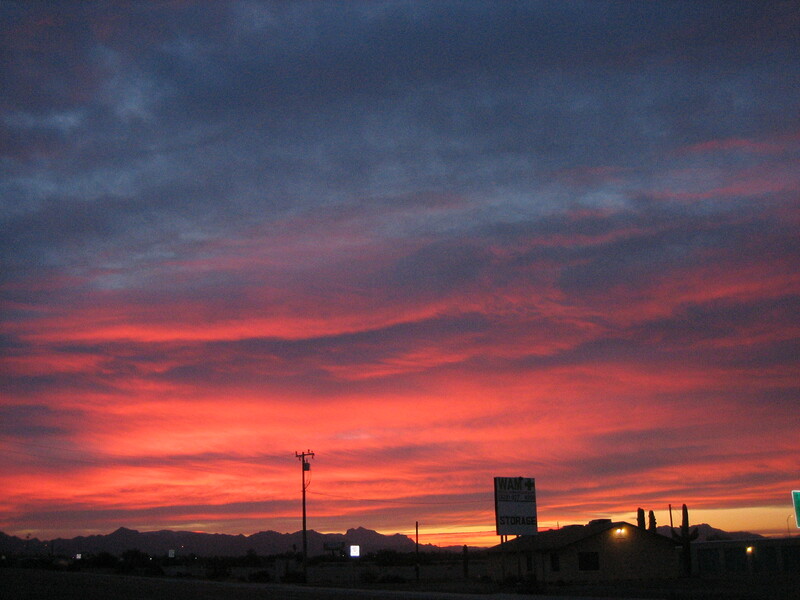 La Mesa has locations in Arizona, California, New Mexico, and Florida. (I don’t know if the other locations give out free food.) When I’m driving along and see the sign at one of the other locations or if I see a La Mesa commercial on TV, I shout, Pancakes! 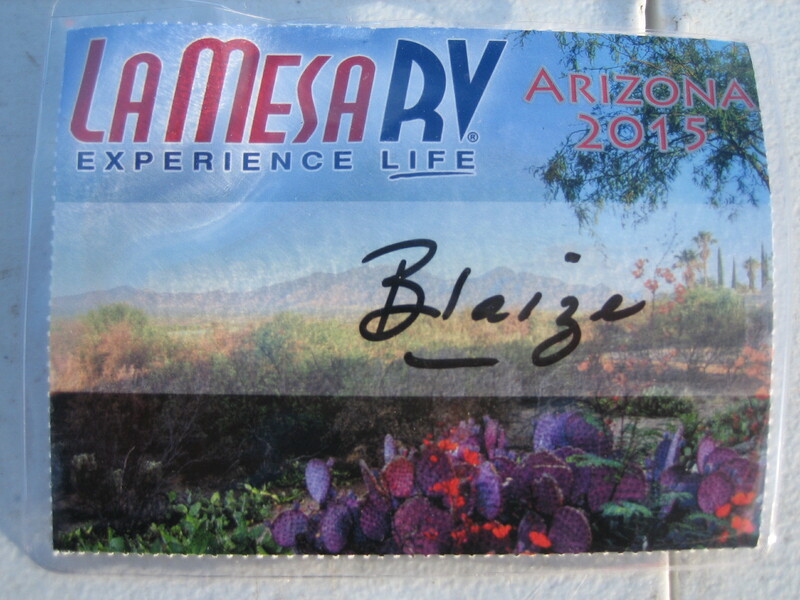 I’m not sure that’s the association for which the owners of La Mesa RV were hoping.